I’ve been working on some ideas for a new squad and have now finished a proof of concept. I’ve been heavily influenced by Kari from Ironsleet (Instagram @Koltti) and an incredible force of Red Corsairs. As part of a bulk buy of figures I’ve ended up with three squads to form into tactical units of ten, probably out of a Betrayal at Calth set. I wanted to find a way to develop some unique features for the squads. Spiked shoulder pads are formed by drilling the pad with a large bit in the pin vice, such as 3.5mm. Cocktail sticks were then taken and the tips chopped off. That gives two spikes straight off. The others were cut and whittled from the same stick with a scalpel. Helmet plumes in the mark IV armour pattern are heavily influenced by Roman centurion helmet designs. I think they look a bit rubbish so turned mine to run from to bak with a bit of shaping. A skull was then modded to fit at the front. Just need to build up the motivation to do a load more. After starting the strip down of the old Devastator squad some time ago, all of the original figures have been reassembled, scaled up and formed into my first 10-troop unit, this time a tactical squad. On the left is the proof of concept marine, then we have a flamer equipped marine and a comms specialist. All marines cary the tactical squad insignia on the left leg of their lower leg armour. The squad sergeant uses the original head with some green stuff modelled to provide more hair. He also uses a loin cloth our of a later model set. The model on the right below is a very old Rogue Trader era metal figure. 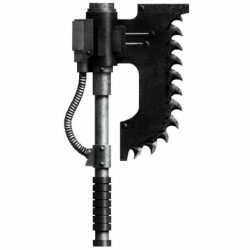 The chain bayonets were another defining feature of the original Space Marines boxed set. The original pattern Bolter now seems to be positively anorexic in comparison to the newer models. I have a real soft spot for the original pattern missile launchers. I just think that it was a great design. The later missile launcher specific backpack is much better looking that and functional than the original and stick on missile ammo packs. That communicator was also a defining feature of the original set. I also enjoyed creating the backpack with the skulls for exhausts. That’s definitely a design that I will use again. So following on from the earlier post that very old Corvus pattern marine has ended up looking like this. Old made new. I like it. Having cleaned up one of the Corvus Pattern troops I set about working out what was necessary to scale a model up to be comparable to the newer models. The body is about the same but the legs are shorter so I decided that that making the feet bigger by adding soles using correlated plasticard (~2mm) and adding a little to the waist (~1mm) seemed to do the trick. In the case below I also modded the leg positions from the crouched forms out of the early legs had. Arms on these early figures used a form of ball and socket type join and to fit more modern arms the body needs the ball joints chopping off the problem with this can be that the arms are too close together to grip a modern bolder so make sure you’ve tried that before gluing them on. Mine needed pinning and some green stuff. 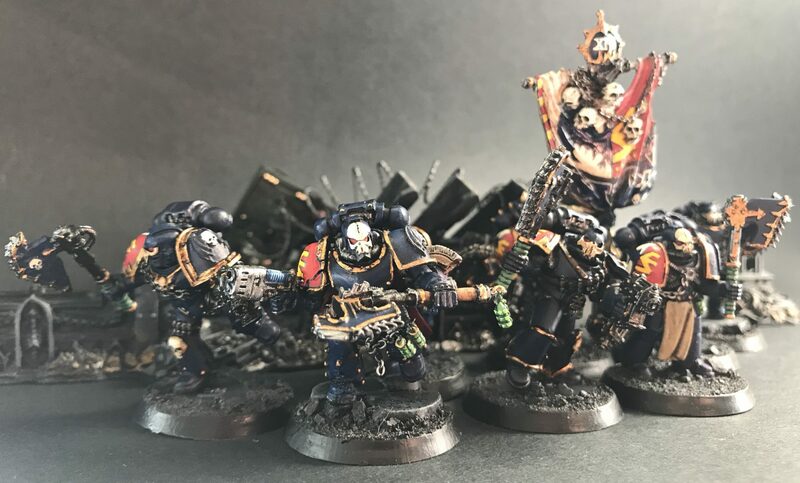 This is the chronicle of the 19th Company of the Night Lords Chapter. The Skull Reapers were known for their savagery long before they were swayed by blood lust of Khorne.